Giancarlo and Davide Ponte, with Linda Paci's help translating, led us through a wonderful vertical tasting of their signature Carlin de Paolo wines. 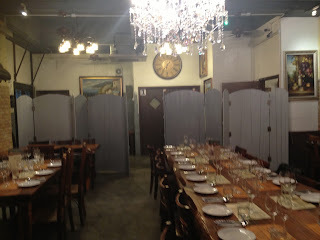 With the back room in Factory 99 to ourselves, we had the perfect set up for a proper wine dinner. After everyone mingled over salmon, salami, calamari, and Moscato d'Asti (if you've not tried this delicate honeysuckle, you're missing out), Giancarlo explained about the four generations of Ponte family wine making. He went on to tell that he and his brother, Davide, founded Carlin de Paolo in 2000 and named it in honor of their grandfathers, Carlo (nicknamed Calin) and Paolo. 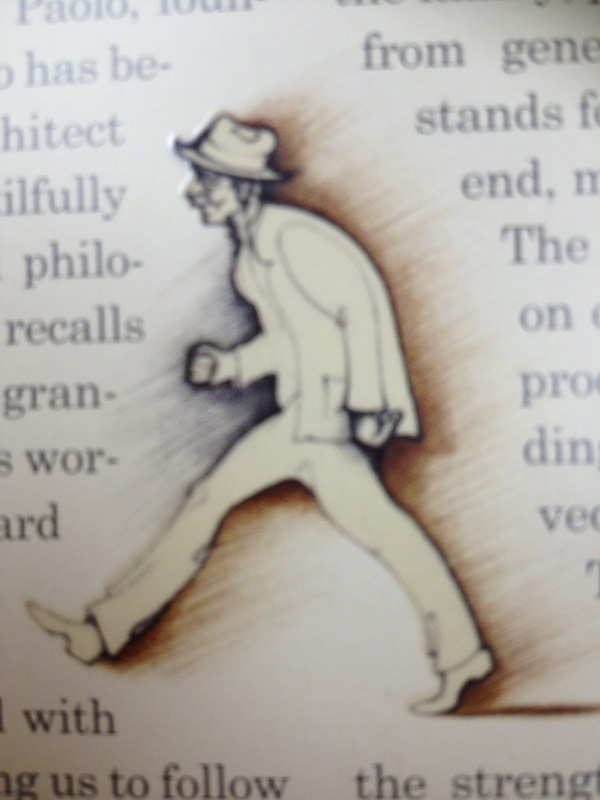 The symbol of the old man walking on every one of their bottles is an ode to both grandfathers, demonstrating hard work, progress, and sacrifice. The man is bent representing all of the years of hard work in the vineyard. His fists are clenched to show he never complains, but is always cheerful. 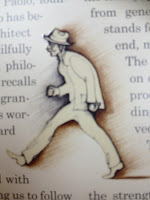 Long stride moving into the future. Brown for working in the soil and love of family, and the priceless advice passed from generation to generation. Black stands for life, marked by toil and sacrifice. Beautiful! After, we all enjoyed our first flight; Barolo DOCG 2008 and Barolo DOCG 2007. At first the Barolos didn't taste very Barolo-y . They tasted more like a Cabernet with tight tight tannins. After breathing for close to 2 hours the 2007 really opened up to something totally different and well, Barolo-y. 2008 had been a very wet year in Piedmont, and the wine reflected this. I think most everyone preferred the more concentrated 2007. 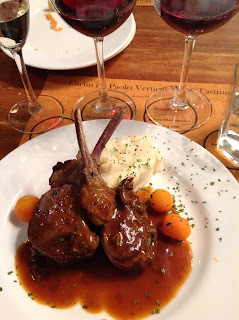 In additon to the wines, everyone joyously gobbled our first plate of Factory 99 magic; rack of New Zealand lamb, mashed potatoes and baby carrots. Divine! Next up were the flagship wines. The specific area in Piedmont where the Ponte's live and create is famous for one thing; they're Barberas. And these certainly didn't disappoint. I think most people outside of Italy are not very familiar with this grape, and it's an absolute travesty. I know our oenophiles, horesetrainers, property tycoons, flower power, retired force, electric bike & google winer, insure, hoteliers, and lawyer all enjoyed it as much as HOFWs did. And the most brilliant part was watching Giancarlo, Linda, and Davide speak with such passion and reverence for this magic that they created from their soil. We started with the Barbera d'Asti Superiore 2009, then the 2008, then everyone's favorite (and wine that's in short short supply) the 2007. They are all light in body, full of bright red fruit flavors, and are just absolutely meant for so many different kinds of food. Which brings me to our next course; piquant beef that was ohh so buttery it melted in your mouth. It's heavy hitting pepper sauce was quelled with a supple sip of 08, and was highlighted with my favorite, roast pumpkin, and mushrooms. Exquisite! 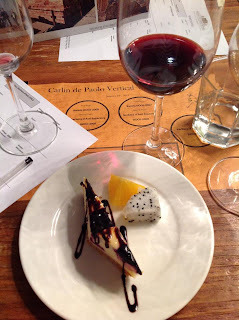 Finally, after everyone was free to move about between wines, revisiting old favorites, we served a blueberry cheesecake with truffle coffee. That's right; truffle coffee. And it's just as it sounds; ground coffee with black truffles in it! It really is wonderful, and seeing as Valnerina is the only one in the world creating it, you better get in touch if you want to give it a try. Coming to market soon! We also served one final wine; Barbera d'Asti 2011. This was another crowd pleaser, and to me is a breakfast wine. Or if you don't want to go that far, a picnic wine. So bright. So purple! So chock full of berry flavors! You would be doing yourself a disservice not to be sitting in a field drinking this wine in the sun with a cheese plate. Fact. Huge, huge, huge thanks to Linda, Giancarlo, and Davide for traversing 10,000km from home, through China, chicken feet, and sickness, to share their wines, their enthusiasm, and their passion. We now have extended our family to Piedmont, and that's pretty amazing.